They will remember—it is all going inside their heart. For my birthday a few years ago, we gathered with some close friends and our kids and Clay. According to our tradition, everyone tells the birthday person why they appreciate them or how they have been blessed and then the birthday person gets prayed for and blessed by all who are at the celebration. We have practiced this for many years and we have seen our children's souls practically burst with the goodness of life-giving words and prayers just for them. All of my children communicated the most wonderful blessings to me. Nathan said, "Mom, as I look back on my life, I am beginning to realize just how much time you invested in our lives. From daily devotions, manners, learning to do chores, educating us, correcting us, providing lessons and leadership opportunities and counseling us on every possible subject. I just want to thank you for investing so much time and giving up yourself to make my life strong. Everywhere I go, I hear your voice wisely telling me what to do." I was quite surprised. I had waited years and years to hear these words, but the thoughts seemed to ripen in their minds as they reached adulthood. As I pondered all the wonderful words of life given to me that night, I was reminded that investing in a child's life, mind, soul, heart, habits, and education, takes lots and lots of time and training. I know, now, with 4 grown children, that every day of love, taking them into nature and pointing out beauty, teaching them truth, reading a favorite story is going deep inside and forming their very hearts and souls. But that daily training--”NO, not this, but this; no not this, but this” a thousand thousand times!—This is what it takes to shape a strong soul. Self-actualization is a term that has come up in conversation a lot this week. All of my children have talked about how they grew into believing they could bring light to their dark world because of the way we trained them and talked to them, over and over again. We spoke forward into their lives--into the adults they would become. "I believe God has a special work for you to do in the world. You are my right hand helper and you have learned to work so responsibly. " "I love seeing your heart of compassion. Bringing all your friends from your drama club was a gift. You are such a good influence in their lives. Thanks for helping me clean up all the dishes from their time here. I know you will be a leader of women." "Maybe you will write great works like Lewis and Tolkien did. You have such a grasp of truth and beauty and such a great way of expressing it. I know it took a lot of hard work to write your essay. Great job. " "There is no limit to what God might do with a heart that is completely His. He would love to bless your ideas and dreams if your heart is His. Your diligence will pave the way. " This week's Way, number 15, is all about giving your child a sense of being a servant leader as a part of their self-image. Part of perceiving oneself as a leader is understanding that God has created them to serve, and that it is the glory of a person to serve well. But another aspect is building a strong family sense of community. Each morning, after breakfast, I would put on lively music and have all of the kids do necessary chores to restore our house to order before we began the day. We would all rock out together while one put the dishes in the dishwasher, another swept, another straightened the room where we would be reading, etc. Before we had guests, each of us would have an area to manage: picking up, setting the table, writing a personal welcome sign on the ever-present chalkboard, or lighting candles. I would tell them how much I appreciated them making our home so beautiful. At our ministry conferences, each had a task. Little ones would welcome moms with a basket of chocolate. Older kids would run the book tables. Each year, all of them had to give a short talk, greeting, song or prayer at the conferences. Truly, having our children serve together for many, many years is one of the key components of their current perception that God has called them to impact their worlds for God's kingdom. As you learn the truth of this way, have a grid to encourage your children that family is always to help each other, and that they are so very precious to be willing to serve others. Giving your child a self-image of perceiving that God wants to use them in their world, will shape their work and service the rest of their lives. Giving them practice to serve each other will build strong relationships between siblings when they grow up. 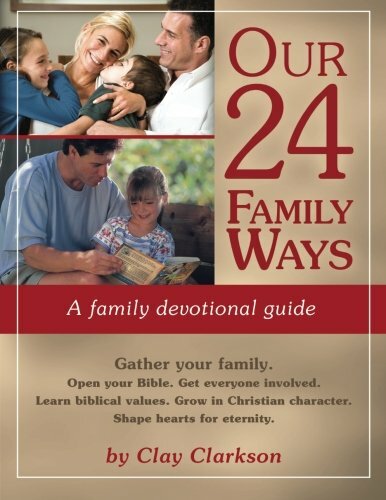 Find Our 24 Family Ways here! Older PostAre You Your Child's Adversary, or Advocate?